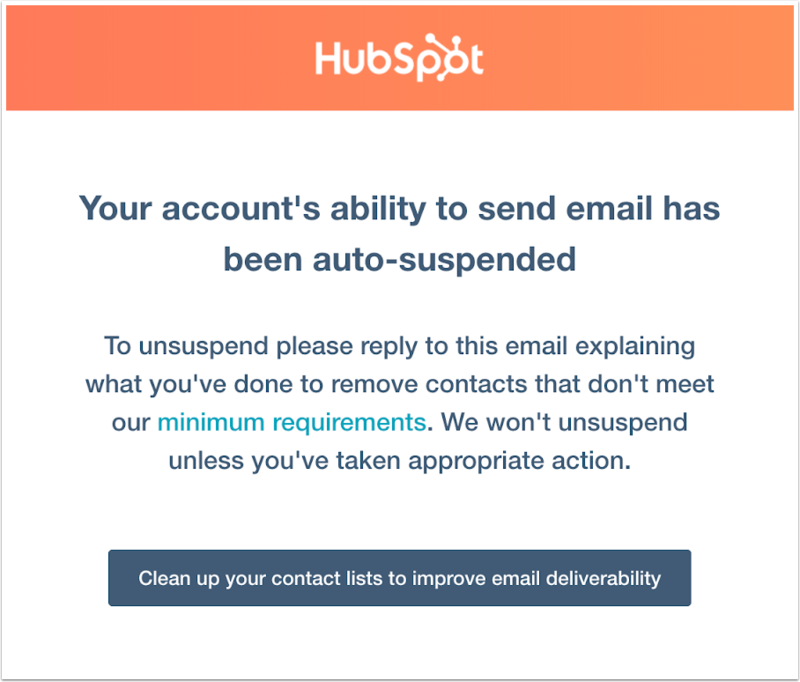 Email sending is suspended when HubSpot's automated abuse prevention system, Deliverability Protection, sends a small portion of the email out to test and determines that the hard bounce rate will exceed industry limits. If your email generates high bounces or spam complaints, it can impact your ability to reach your subscribers next time around. Are my workflows halted during a suspension? What are the email limits? What should I do if my email sending is suspended? If the system sees too many hard bounces, spam complaints, a blacklisting, or direct complaints to HubSpot's abuse desk, it may temporarily halt more email from being sent. A suspension does not mean that you are a spammer. Suspensions are not punishments or meant to hinder your marketing efforts, but help you remain successful in your email marketing. Yes. During a suspension, any workflows, lead nurturing or other HubSpot-generated emails will not be sent. Hard bounces: HubSpot's hard bounce limit is 5%. For reference, many ISPs prefer bounce rates under 2%. Spam reports: HubSpot's spam complaint rate limit is 0.1% (1 in 1,000 messages sent). Spam reports are when the recipient actively clicks the "spam" button when viewing the email. Direct complaints: if a direct complaint is sent to HubSpot's abuse desk about your emails, email sending may be suspended. Unsubscribes: you will not be warned or suspended for a high unsubscribe rate. For CRM Free, when marketing email suspension occurs, email sending will remain locked. You may still continue to use other tools in the HubSpot platform. For Marketing Hub Basic, Professional and Enterprise subscriptions, the HubSpot deliverability team will always reach out within 24 hours of a suspension, even on weekends and holidays, and generally sooner than that. If you need immediate assistance, respond to the email suspension notification and include your Hub ID, and you will be contacted as soon as possible. In the meantime, review the performance of your recent emails. If you have an idea of what may have happened, it will significantly expedite the process of restoring your email sending. For Marketing Hub Starter or free trial subscriptions, when your account has suspicious fraudulent activity, a banner will be displayed in your email tool explaining that sending has been suspended due to fraudulent activity. Click the link in the banner to submit more details about your business and email lists to your account manager. They'll review your responses to decide whether your account can be unblocked. For Marketing Hub Starter or free trial subscriptions, when too many emails have bounced, a banner will be displayed in your email tool explaining that sending has been suspended. Have not been contacted by your organization by email in more than a year. List decay occurs at a rate of 25% every year. Unsubscribed from your email previously (outside of HubSpot). Hard bounced previously (outside of HubSpot). Have not opted into email from your organization specifically. This includes contacts provided by a third party. Are purchased or rented from a third party. This is a violation of HubSpot's Acceptable Use Policy and these contacts cannot be emailed using HubSpot.